This past week I came face-to-face once again with the power of the Angel Quilt ministry. It happened in Dallas as I had the blessing of delivering a quilt to FPC member, James Norton. James has had his fifth of seven chemotherapy treatments. As he turned the quilt over in hands, he said, “I can’t believe they made me one of these!” He was visibly moved by the gift of the quilt. 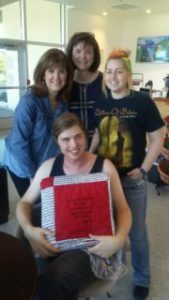 James is just one of literally hundreds of people who have received Angel Quilts from the Angel Quilters ministry which began at First Presbyterian Church, and now includes First Baptist Moores Lane, Trinity Baptist, Williams Memorial United Methodist. and First United Methodist, AR. On September 21st, quilters gathered at FPC from each of these churches to celebrate their sisterhood in Christ and affirm their passion for Cancer patients going through treatment. The highlight of the luncheon was Beverly Coleman, Registered Nurse Oncology Specialist, who told the group about what an impact Angel Quilts make. She has the privilege of presenting patients in Dr. Eichler’s Oncology Office with quilts in the colors they request. The message of Jesus Christ and his love, healing, comfort, and hope go with each quilt as recipients are reminded that many prayers from dedicated Angel Quilters go into each quilt. You can hear Beverly Coleman’s inspiring message first hand at Family Night Supper, 6 pm, December 15, at FPC Texarkana, 516 Pecan St.